Oh man, where do I begin. Lyndsey and I have ordered from Assinis before and it has always been good. I usually order their pizza and Lyndsey has the chicken souvlaki, but this time we both decided to try something different. What a big mistake. I ordered the Fresh Tiger Prawn dinner pictured above, and Lyndsey ordered the Greek Style Stir fry. I’ll start with the stir fry. I’m not sure what part of it was “Greek Style”. 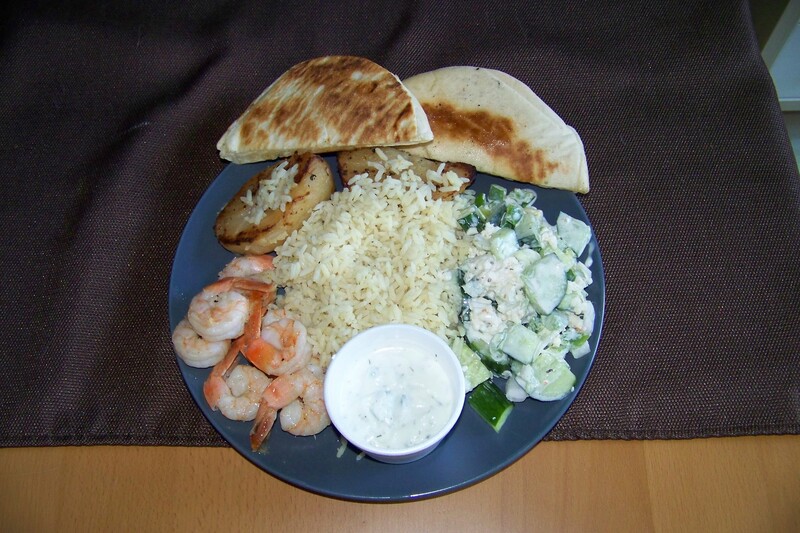 the chicken had no flavor and there was nothing Greek anywhere else in the dish except for the pita bread and tzatziki that came with it. Very strange and very disappointing because the idea sounds pretty solid but it wasn’t even close to being done right and came across as a poorly done regular stir fry. The Fresh Tiger Prawn dinner was just as disappointing. The “Tiger Prawns” were not tiger prawns, they were shrimp. Peeled, de-veined, tail on, frozen shrimp that were over cooked and rubbery, soaked in enough butter to make me drop dead from a jammer on the spot. I’ve never really liked Greek roasted potatoes so all I will say is that they were what I expected. The rice was bland, the Greek salad was creamy (?) and soggy. Again the only thing that was good was the bread. This is my first review of a restaurant in the burbs and I was hoping to be wowed so I could tell my suburban peeps that all was not lost if you don’t get downtown all that often, however all I can recommend from Assinis is the pita bread and the pizza, which is actually really good. If you feel like trying it for yourself you can find Assinis at #109 – 15551 Fraser Hwy in Surrey, I wish you better luck then I had. I find it a little sad that you can find better Greek food at a shopping mall food court franchise then at a stand alone restaurant. They also have takeout (which is what we had) and delivery, the staff is very nice and our food was ready when promised. A friend’s parents owned that restaurant for years but I don’t think they do any longer. I’ve never eaten there but I heard at one point it was pretty damn tasty.